A Simple Way To Find Out How Much Weight to Lift? Home Workouts And Exercises How Much Weight Should You Be Lifting? These are two of the most asked questions I hear from those who are looking to shape and strengthen their bodies via weight or strength training. I always advise that before you try to figure out how much weight you should lift, make sure you know how to perform the movement correctly, as flawless as possible, without using any weight. Tip: The most important is to first learn each exercise movement without using any bars, dumbbells, or added weight. Read on here to learn how to determine the number of reps you should do, the weight that you should lift and when to increase the weight for each exercise in your weight or strength training program. A Simple Way To Find Out How Much Weight to Lift! When creating your weight training workout routine, you need to know how much weight should you lift for each exercise. Although this question is typically a lot more common for the beginners, but it’s actually a question that can arise at every experience level the first time you do an exercise, which you’ve never done before or just haven’t done in a long time. So you need to find out what weight will be perfect for you to use on that specific exercise, which should be neither too heavy nor too light. Well, here’s the super simple way to figure out how much to lift and when to progress to heavier weights. Let’s assume you are doing a workout program of 6 exercises with 3 sets of 12 repetitions of each exercise in a general fitness program. At the outset, you need to decide how many reps you should be doing for an exercise. The ideal weight to lift is related to the number of reps you are aiming to do. Note: Reps (short for “repetitions”) are the number of times you move a weight from point A to point B during a set of an exercise. (i) If you’re using a pre-designed weight-training program, all you have to do is look at how many reps it recommends for each set of the exercise. (ii) If you’ve designed your own weight-training program, then you just need to find out how many reps per set is most ideal for you. Generally a more common weight-training program incorporates 3 sets of 12-15 repetitions. The second step in finding out how much weight you should lift for each exercise is to figure out what that “ideal weight” sweet spot will feel like so you can easily spot it when you reach it. Unless your specific workout program states otherwise, you should use a weight that is light enough for you to perform the number of reps you are aiming to perform per set for the exercise, but nonetheless heavy enough so that you couldn’t do additional reps beyond that point. For instance, let’s presume that you’re trying to perform 3 sets of 12 reps for an exercise. The weight you choose should be light enough so you can actually do about 12 reps in all 3 of your sets, but nonetheless heavy enough so that you can not lift that weight many more times than the 12 reps you are targeting to do. To explain further, if you cannot complete 12 reps or at least reach within 1 or 2 reps short of 12 in all 3 of your sets in this example, the weight is perhaps too heavy. However, if you can complete 12 reps in all of your 3 sets not only with ease but can continue to do few more reps then the weight in this example is perhaps light for you. So, somewhere between those two points would be your sweet spot. Now you know that your sweet spot is between these two points, but still you have to determine it….. So you have learnt to determine how many reps you need to do for each set of an exercise, and how your “ideal weight” for that exercise should feel like. Now it’s just a matter of taking a best guess and then calibrating based on what happens. So, make your best guess to choose a weight and lift it. Trick is to select a weight that you guess would be a little light for doing the already decided number of sets and reps and then lift it (remember to use correct form). Then based on how you feel, just gradually increase the weight until you reach a weight that is just right – neither too heavy, nor too light, and that’s it. You have determined your so-called sweet spot for the sets and reps range you desire to do. As you continue exercising, you will start gaining muscle gradually and getting stronger as well. After some time you’ll notice that you are able to do the exercise using your “sweet spot” weight with less effort. Using the same example as stated above (3 sets of 12 reps), you might feel like that you can now probably perform 3 sets of 15 or more reps with the above chosen weight. This is good… and anticipated. It means your body-strength is improving, and this previously ideal weight is no longer sweet-spot weight for you any more. 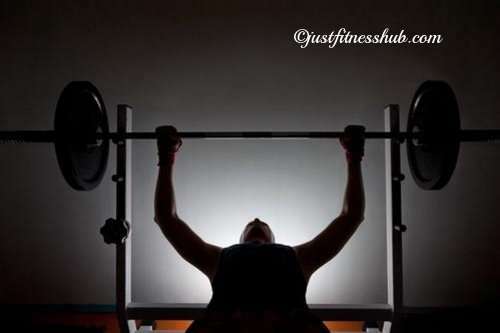 This is an indication that if you want you may now increase the weight you’ve been using for the exercise by the smallest increment possible and lift it for your targeted number of sets and reps from this point on. In due course, this new weight may again become light and easy for you, at which point it will again be time to progress, i.e. increase the weight. This process is known as progressive overload, and is a fundamental principle of weight training progression. (i) If you can’t find a suitable increment, that is, the dumbbell or barbell or plate of the next weight is too heavy, you can either use this heavier weight and drop the repetitions by 2 or 3; or stay with the same weight and increase the number of repetitions in each set by 2 or three or even more. Either way, you progress your training. (ii) Take rest between the sets, one minute or more according to your physical conditions. Please share with us how you decide the number of sets, reps and determine the weight for using in your workout routine.